**NOTE: All photos for this review were taken using the Minis expansion. 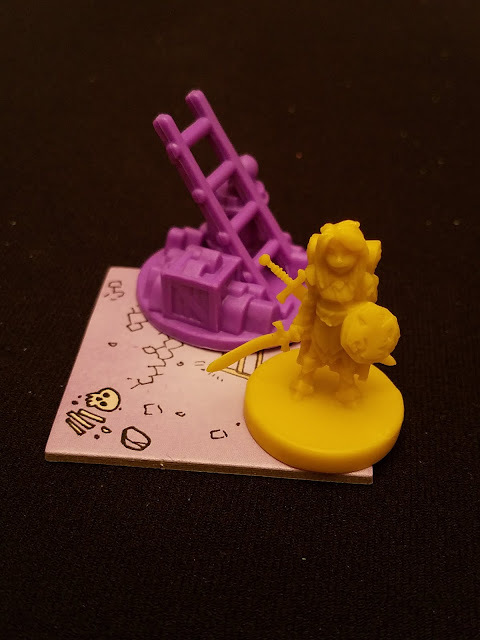 Standard game components include both cardboard standees and wooden meeples. Players are able to choose which they prefer. tl;dr: Insanely thematic fun with the bonus of being asymmetrical. High quality components, variants in the box, there's almost nothing not to like about Vast. Getting to the Game: Setup is based on how many players, and which roles are being played. It can be fiddly, with lots of bits and bobs to prepare, but doesn't feel burdensome. I'd rate setup as average / medium weight, but the real heavy lifting is in the teaching. Learning how to play Vast is its own thing. There are five characters in the box, and each one has its own playstyle and win condition. People have rightly claimed that teaching Vast is like teaching 5 different games at once. Lots of BoardGameGeek threads and reviews have spent many posts talking about this aspect of the game and how to remedy it for your group, so I won't belabor it here. Needless to say, teaching the game to new players is a challenge that needs to be overcome, but there are ways to do it. For our games, I had our group pick out which roles they wanted, and sent them the cheat sheets available from Vast's Print and Play Website. Each person went over these for a little bit before we met, then at the table, we went around briefly and talked about what we could do and how we could win. This seemed to work pretty well. 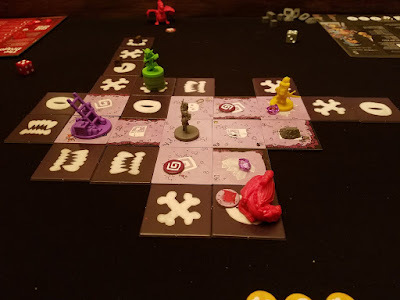 Playing the Game: Vast is an asymmetric dungeon delver, played on a board of sometimes-randomly, sometimes-intelligently laid out dungeon tiles. The key players are: a Knight, who has come to the cave to slay the Dragon. That same Dragon, who is trying to shake off a centuries-long sleep and get out of the cave so they can...presumably live a long peaceful life in the sun. A horde of three goblin tribes, desperate to get rid of the Knight and hopefully put the dragon back to sleep so it stops eating them. A thief, cursed to plunder this particular cave for all eternity until they can extricate enough treasure to win their eternal rest. And finally, most remarkably, the cave itself, somehow-sentient and wanting more than anything to bury all of these interlopers under rock so they can't speak of the mysteries they've seen underground. Depending on player count, some or all of these characters will venture forth with their individual goals. Depending again on who else is there, those goals might change. For example, if there's no Dragon for the Knight to kill, then the Knight is there to smash crystals because...reasons. If it seems like I'm handwaving at a lot of the motivations here, it's due to the fact that this isn't an RPG. It's not even your typical dungeon delver, where everyone's in it for the treasure. Motivations don't matter as crucially here; you bring your own story if you like. With the mindset that everyone's in the cave doing their own thing, it might seem that player interaction is minimal. That's not entirely the case. Because the Goblins are trying to kill the Knight, it's important that they make sure the Knight isn't doing too good a job of killing the Dragon, which might mean helping the Dragon out a bit, even if the Dragon is actually trying to gobble up as many gobbies as he can. It's a hard-knock life here in the cave. I want to call out balance in this game as particularly sharp. In a 5-player game like the ones we played, victory seemed within grasp for everyone, sometimes all at once. When it was obvious that one player was doing much too well, the Cave player was there to send a giant bat their way, and drag them away from their goal, or towards their foe. The concept of the cave player itself is a little strange, but when a designer is able to take what is basically a player role to make sure no one gets too far ahead and make it fun and engaging, then there's something really good there. The balance without a cave player seems like it would be fine anyway (we didn't test Vast without a Cave player, but tile-laying obeys certain rules, and everything else the Cave should do is randomized, so it's not strictly necessary). To add even more to the box, each player can have their own difficulty level. There are five included cards for each character which tweaks their individual goals a bit, acting as a handicap. The base game operates everyone at level 3, so there's plenty of room to move if you find that one person is much better at the game than everyone else. 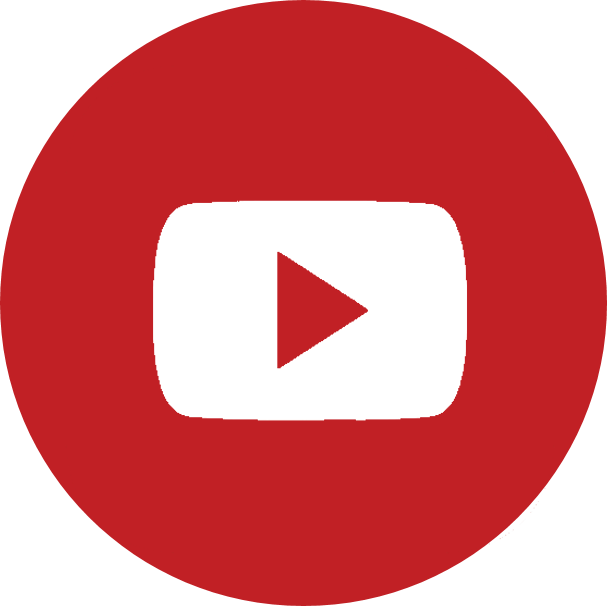 Included in the ruleset is the optional "Campaign" mode, where everyone starts at "Easiest" difficulty, and when one player wins a game, they move up a level, keeping everyone else behind. It's tiny thoughts like this that come included with the game that show the attention to detail in the gameplay was obviously very lovingly applied. That's not to say that this game isn't without flaws. With Vast being what it is, it's going to live and die based on your group. One analysis-paralysis player can bring each round to a screeching halt if they're playing the Goblins, Dragon, or Cave. If the Cave player doesn't have a good grasp on who is winning and why, then their job of leveling the playing field is not only going to be harder, but also probably far less effective, causing someone to rocket ahead to the point where they can't be held back anymore, or worse - someone's going to get messed with too many times and get upset that they're being targeted too much. Some might say that these aren't issues with Vast, but rather with the people you're playing with. I'd agree with that to a certain extent, but this particular game's mechanics will bring those player tendencies into sharp focus. Our games each took over three hours. After the first game, everyone immediately wanted to play again, positive that a second game would go much, much faster. Unfortunately, that was at 11pm on a work night, so I arranged a second night a week later. When that game ended after 3 hours of play, we talked at length about why the game was taking so long. The general consensus was that the Cave and the Goblins can't pre-plan their turns because they only draw their action items at the top of their turn. Additionally, the Goblins immediately follow the Knight's turn, and they have to respond to what the Knight did. So, the Goblins have to take some time to re-think if they don't get the cards they want, or if the Knight did something they weren't expecting. Our Dragon player also had some trouble deciding which course of action was best, because the Knight was relentlessly hunting them, and the Goblins weren't ever near enough to be eaten, opting to stay in the shadows and strike hard, rather than quick feints. Each round took about 10 minutes, which made for lots and lots of downtime for some players. Your group may never have these issues, and other groups might enjoy the smack-talking that would ensue in those pauses. Ours wasn't able to overcome this problem. We never got a third game in. 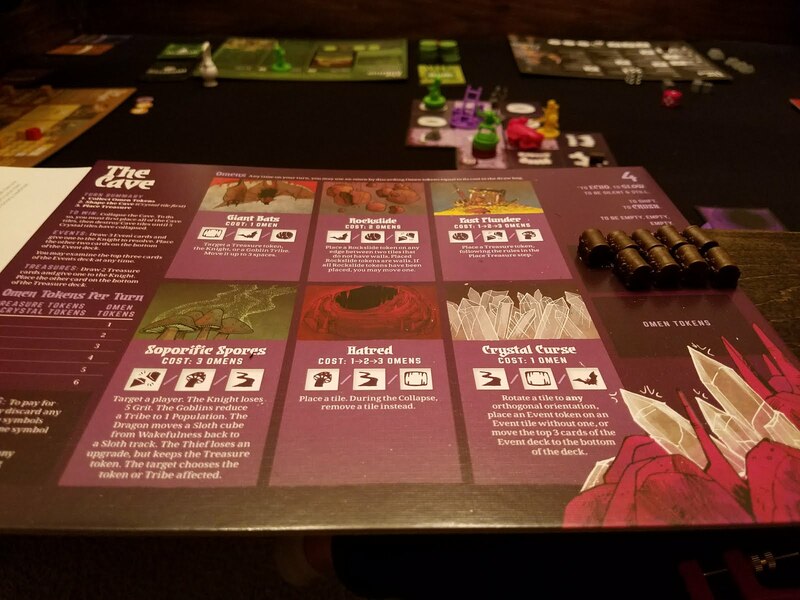 Artwork and Components: As some of our readers might recall from my review of Root, also by Leder games, I'm a huge fan of Kyle Ferrin's art. The style is different here than it is in Root, but it's equally fantastic. From the cards to the tiles, to the overall theme in the rules and box cover, it's just really evocative of a cohesive world and absolutely pops on the table. Component quality for Vast is just as good. The tiles are thick and sturdy. The game comes with cardboard standees for each of the characters, replete with more of Ferrin's art. You also get hefty wooden meeples, silhouetting each of the characters nicely. Acrylic crystals are perhaps a little too small to represent the crystalline structure holding up the cave, but look delightful. For the price, Vast out-of-the-box is an incredible value. 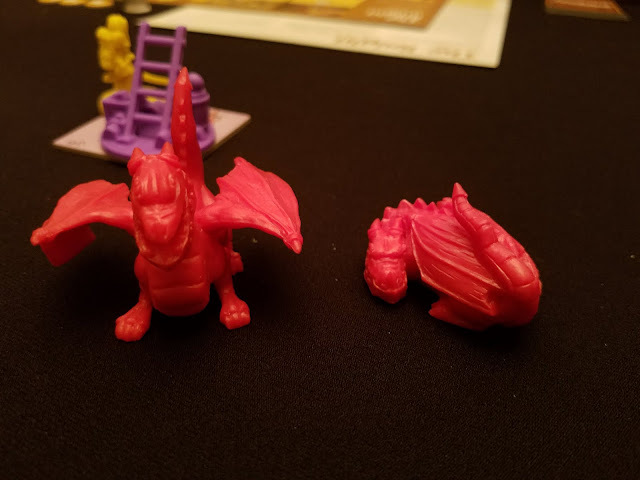 Expansion and Minis: Included for review were the newly-minted Vast Miniatures expansion as well as the Fearsome Foes expansion. The miniatures are a must-buy. 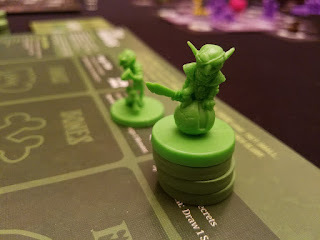 Scroll back up above to the photos in this review to see the character minis in action. Teardrop-shaped dragon gems in plastic are great. The crystal tokens are much larger and do a better job representing what they're supposed to be in the game. The entrance token is perhaps a bit too large, but you won't lose where it is on the table. The Fearsome foes expansion adds three new characters to the game: The Ghost, Ghoul, and Unicorn. Each of these characters has their own alternate as well, which adds a ton of variation to the game. The Nightmare Unicorn variation isn't even a playable character - at the beginning of a game of Vast, one of the existing characters can change their win condition to "Kill the Nightmare Unicorn," which puts the Unicorn on the table and is played through rules by the player trying to kill it. 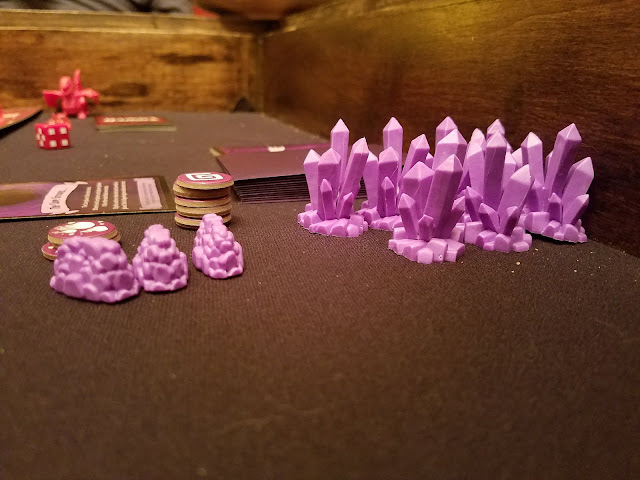 You'll need a huge table to get 7 players into the Cave, and the game itself notes that going above the 5-player recommended count will add significant play time to the game. Cave-at emptor. Both of these expansions are out now. The Good: Very, very near everything. 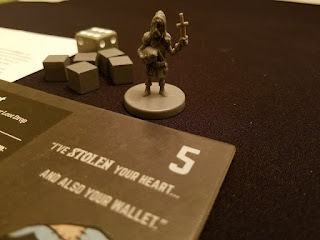 The gameplay is solid, in-the-box component quality is high and the minis expansion gives you even more to love there. Asymmetric gameplay is very high on my list of fun elements, but I also understand that's not for everyone. It's done incredibly well here, a sign of lots of testing and tweaking. Overall, this game is the total package. The Bad: Teaching the game is a big hurdle. Downtime during play can be an issue if one or two of your players is AP-prone. Games can get a little cutthroat if the Cave player misunderstands who's winning, or has a vendetta for a particular player. These are more group-dynamic issues, though, not a fault of the game - Vast is just an enabler. 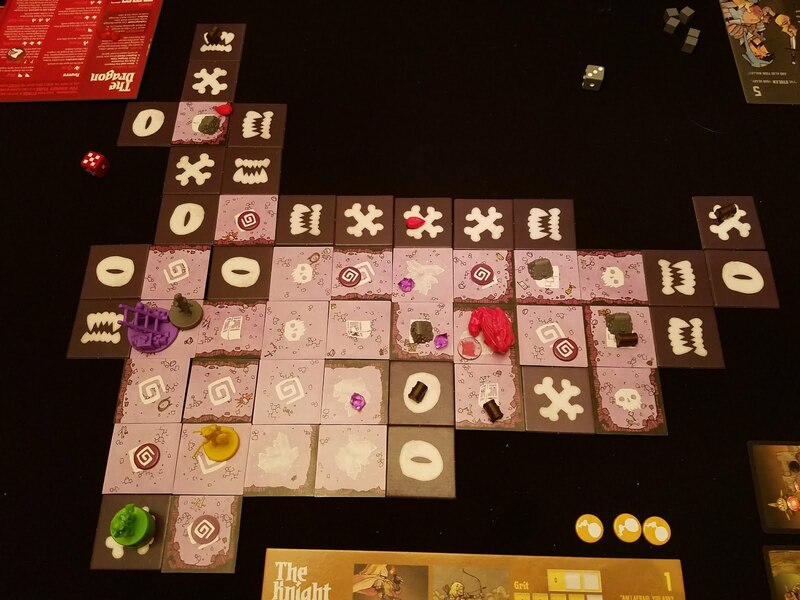 Score: Vast is one of those games that has so much to it, that cracking the shell to get to the gooey center is the crucible for the whole thing. 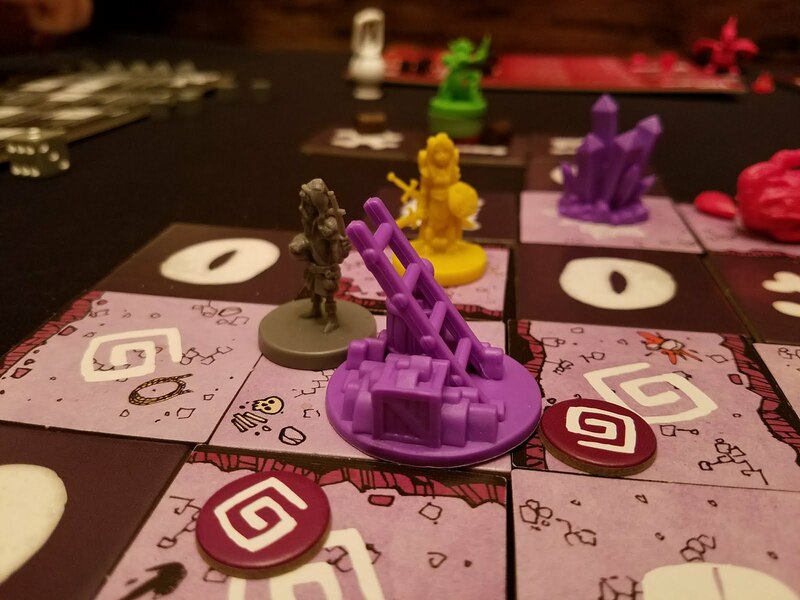 If your group can get through the admittedly tough barrier to entry, and get through the first game that really soars, I think you'll be hooked. 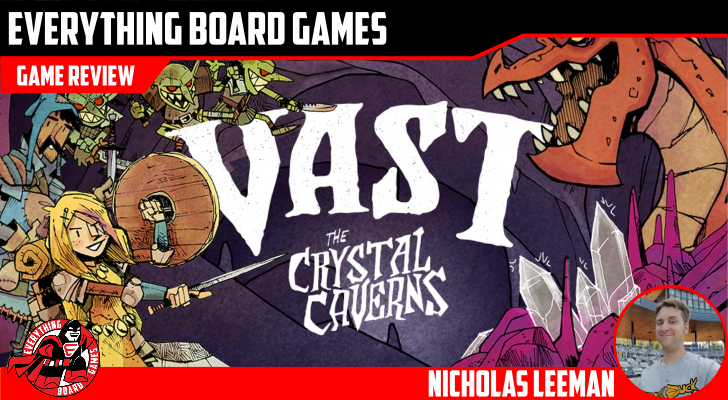 I'm giving Vast: The Crystal Caverns a score of Spelunking Spectacular.